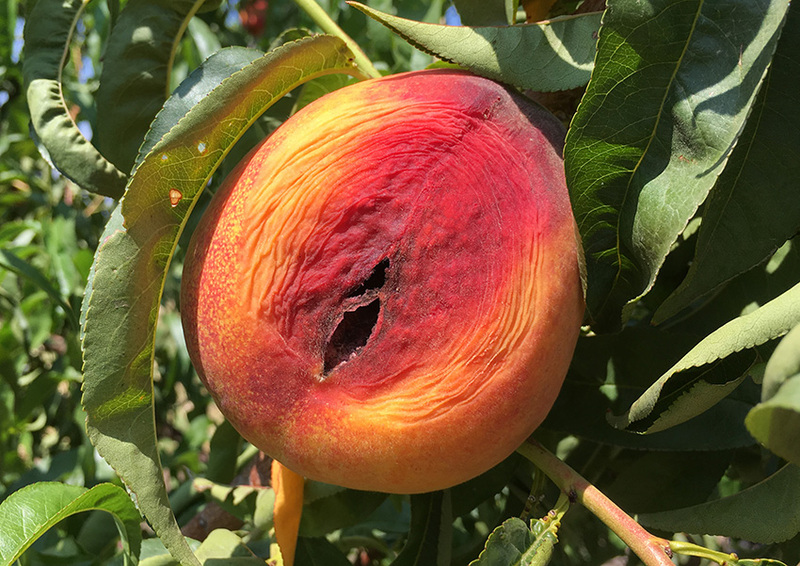 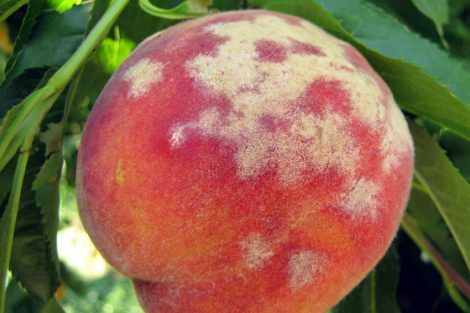 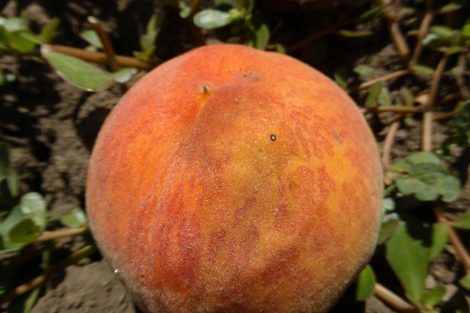 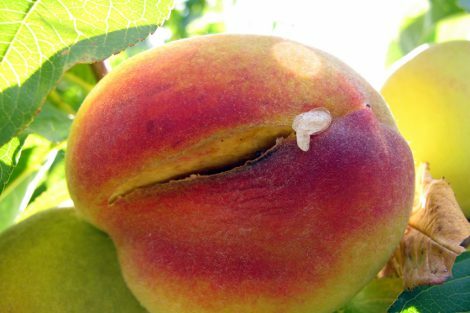 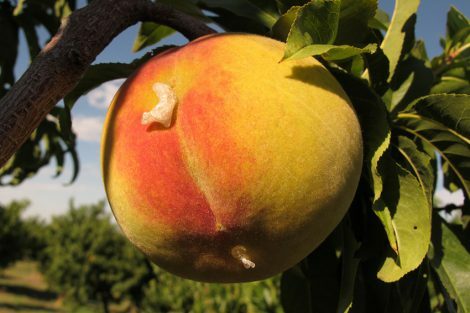 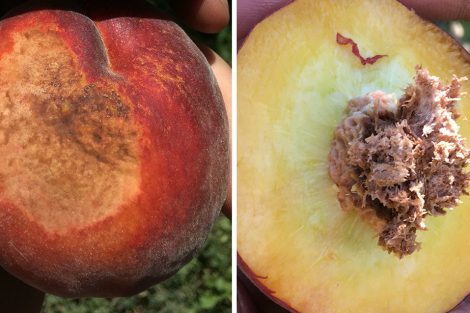 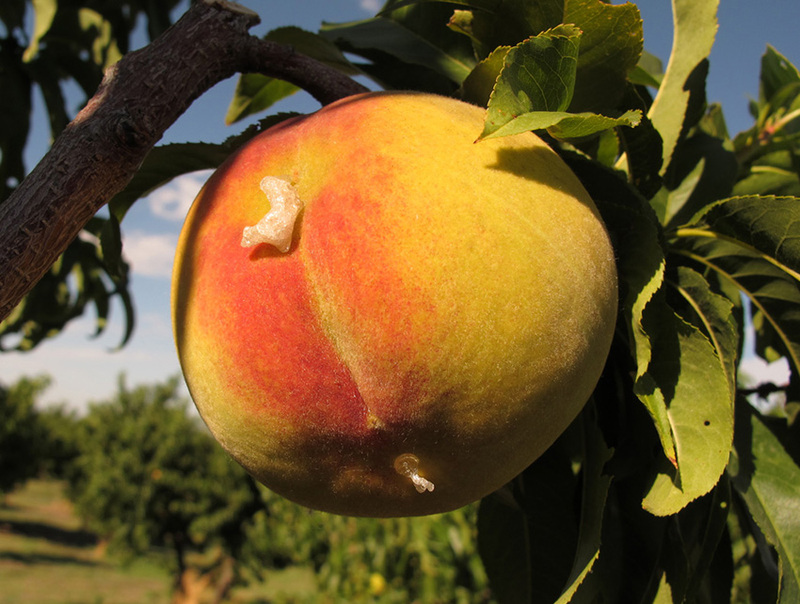 Peach harvest is on, and we’ve seen a variety of fruit damage, ranging from wind injury, powdery mildew, coryneum blight, earwigs, birds, and more. 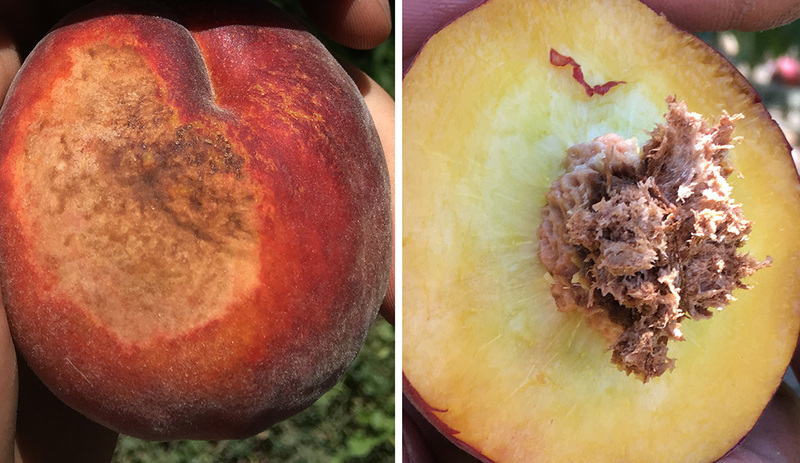 Check out the photo gallery to identify what you may be seeing during harvest. 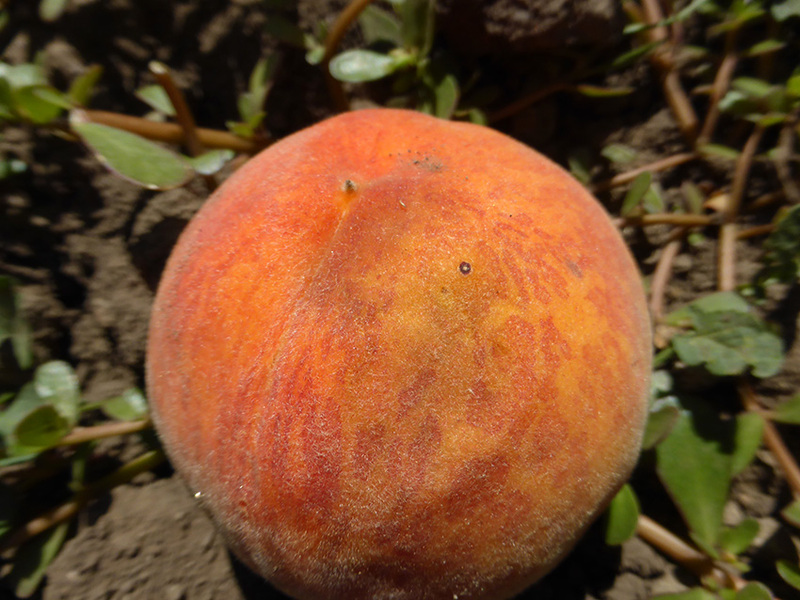 Silvering of peach flesh caused by thrips feeding. 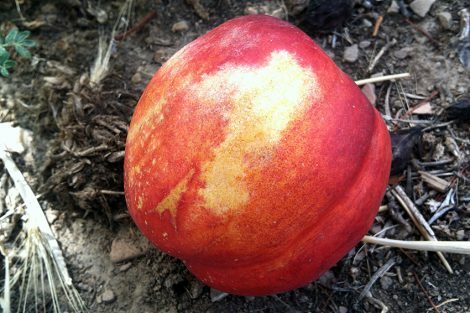 Distorted nectarine caused by thrips feeding during bloom. 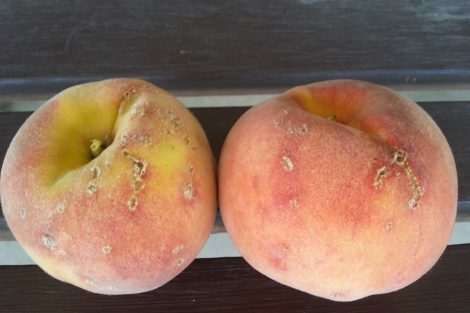 Possible green peach aphid damage to nectarine. 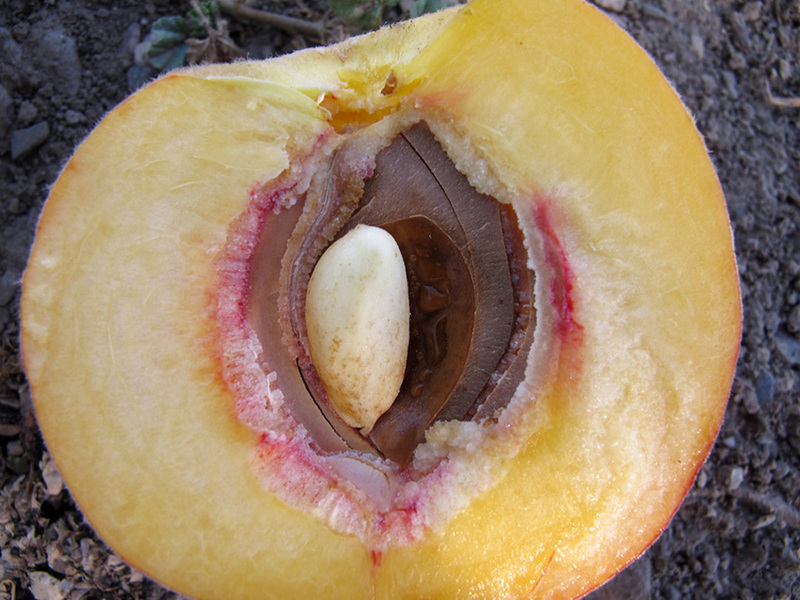 Corking of the interior flesh caused by cool post-bloom temperatures and a light crop. 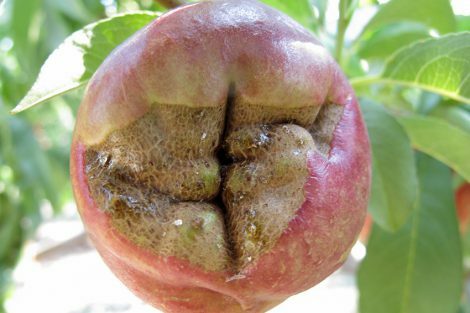 Russeting of the skin caused by an apple powdery mildew infection. 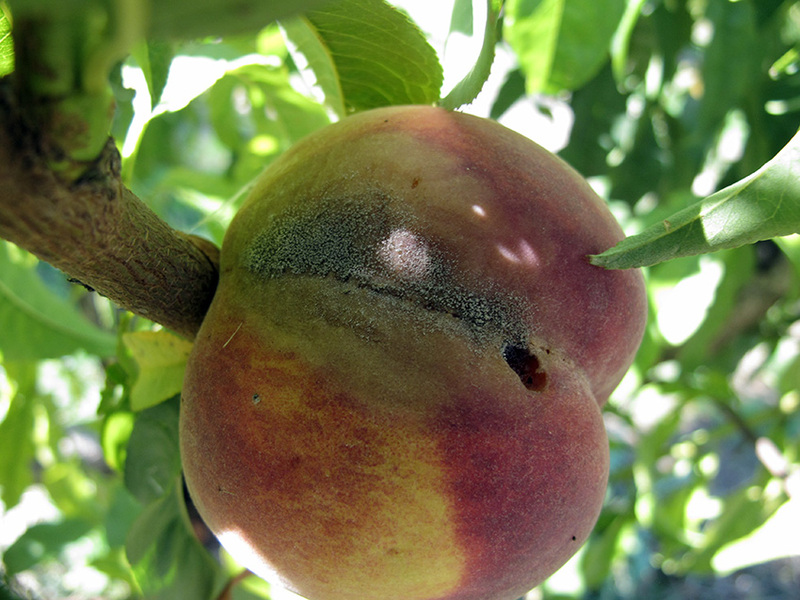 Soft rot initiated by insect feeding. 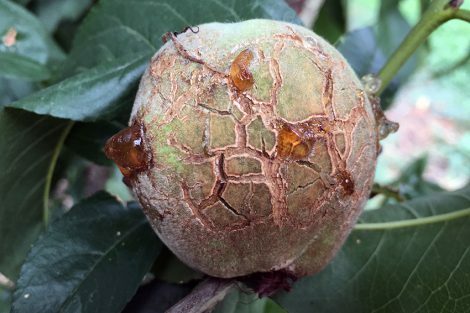 Soft flesh caused by walnut husk fly maggot feeding under the skin. 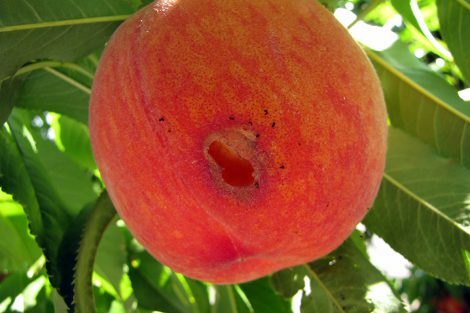 Earwigs create deep feeding holes. 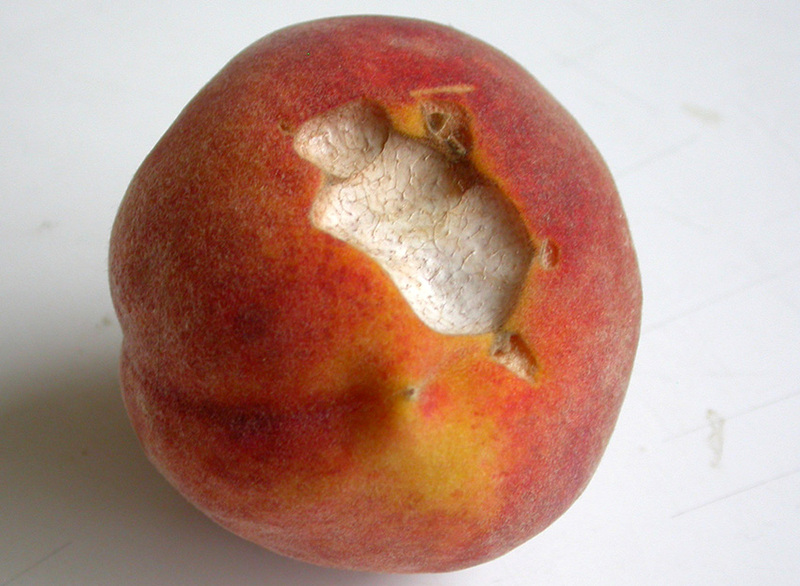 Note the black specks; they are excrement. 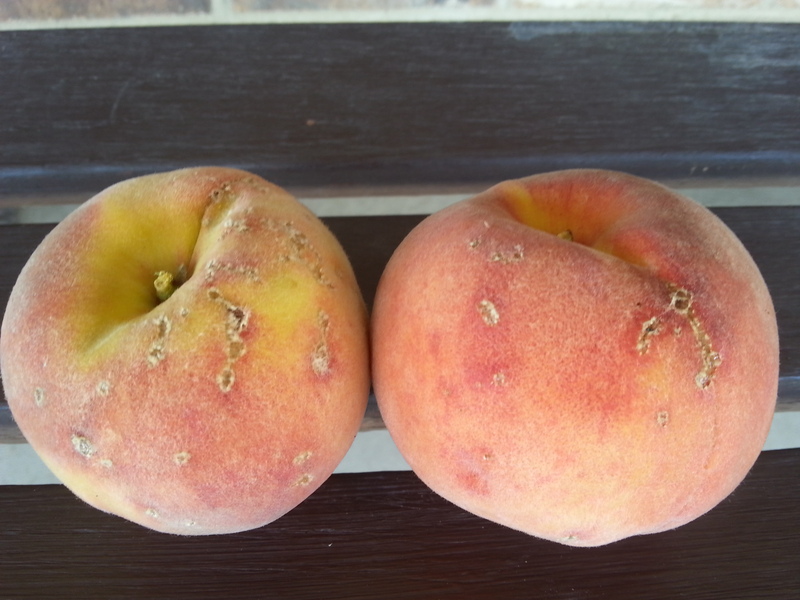 Peach twig borer feeding injury. 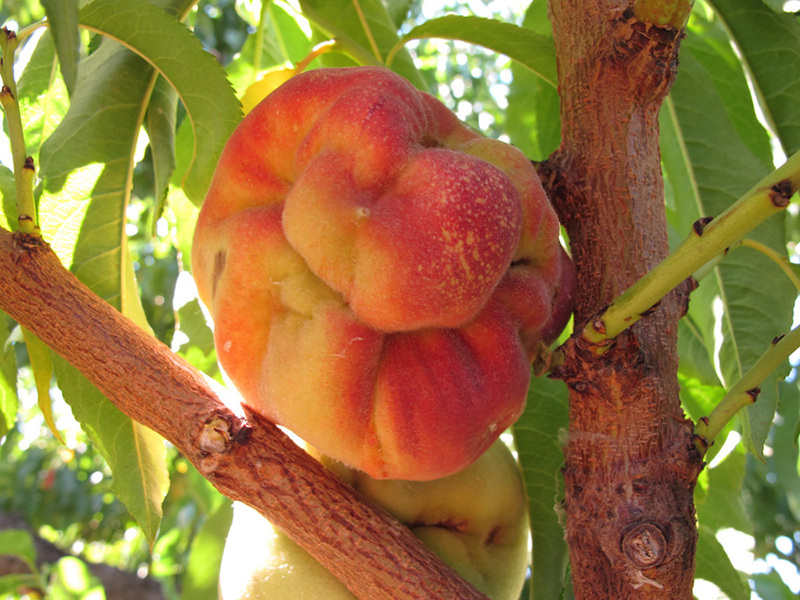 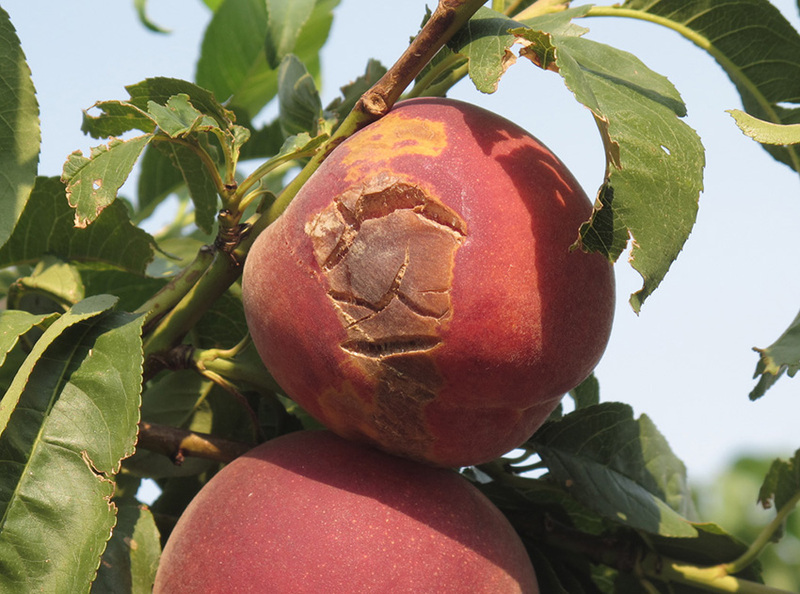 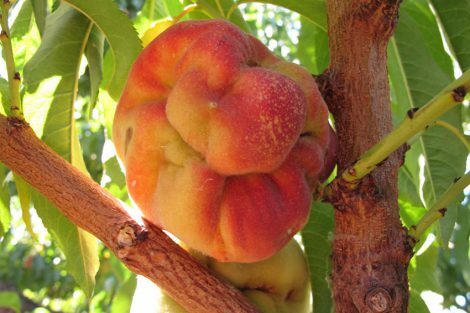 Damage caused by fruitworm caterpillar feeding on the peach. 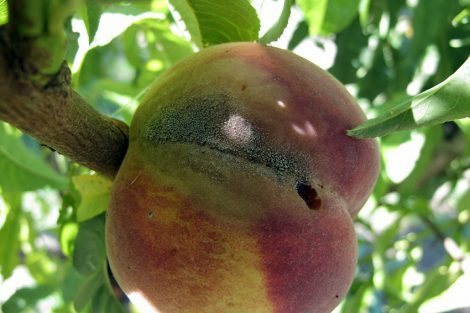 Cat-facing injury caused by either lygus or stink bug feeding. 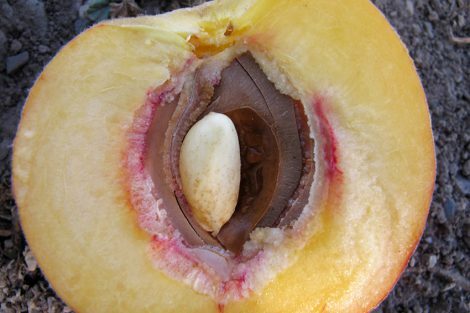 Peach pits that separate from the flesh are considered split pits. 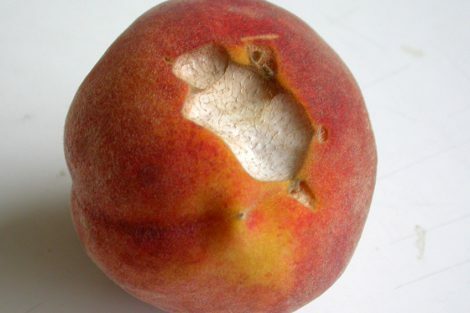 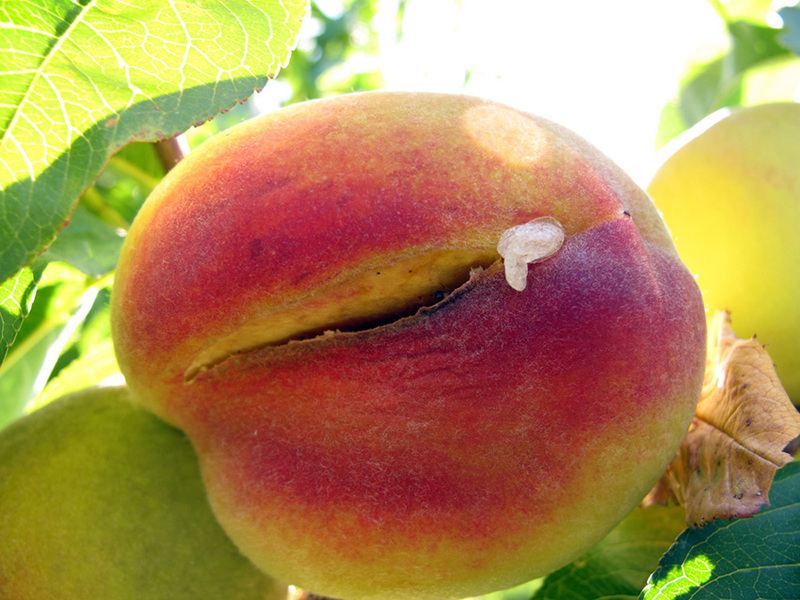 Split pits can result in cracks along the peach suture. 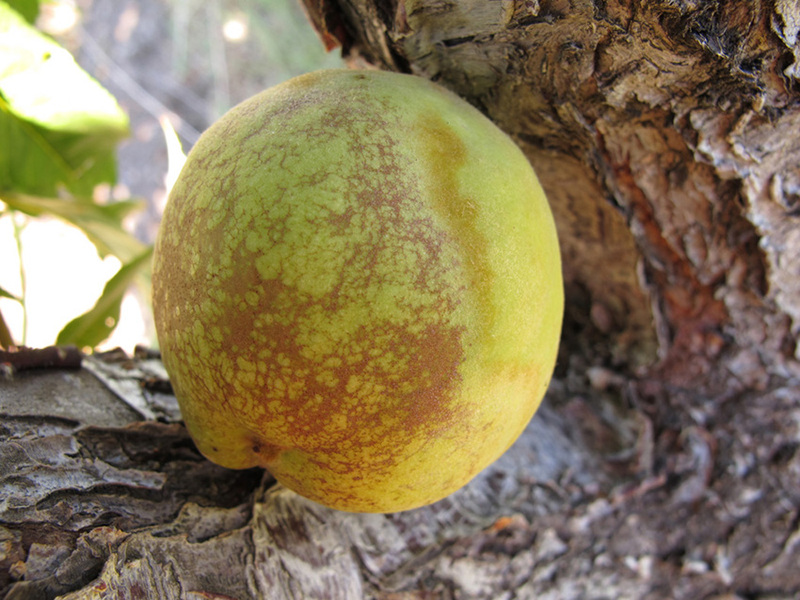 Soft suture, caused by heavy watering after a long dry spell. 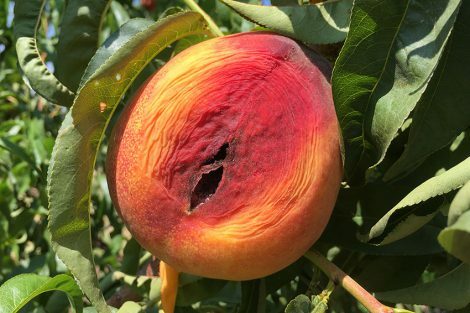 Gumming oozing from center of peach due to split pit. 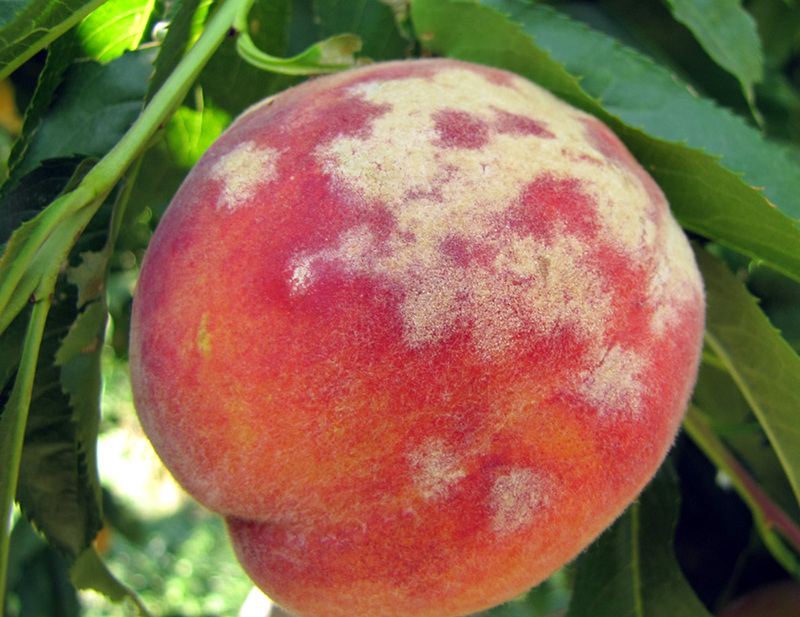 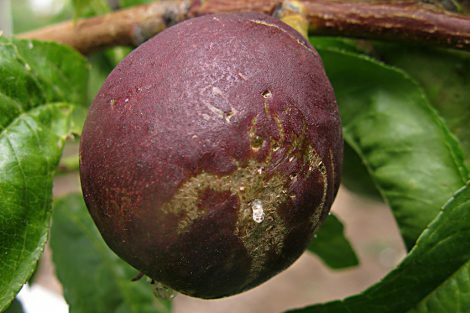 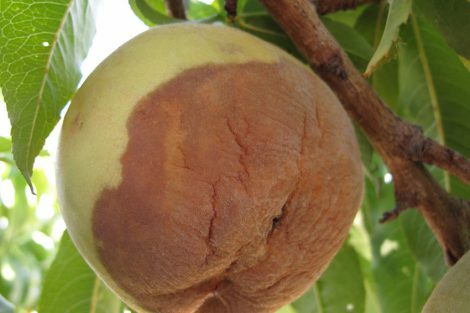 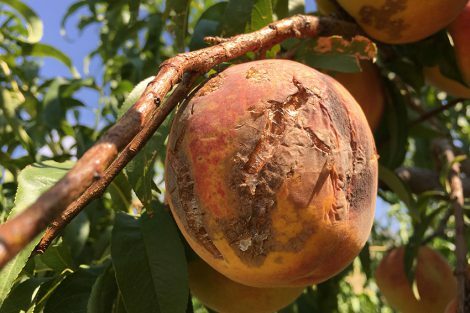 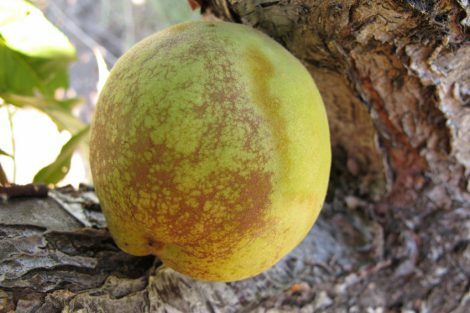 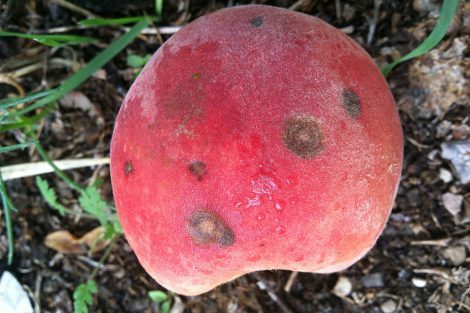 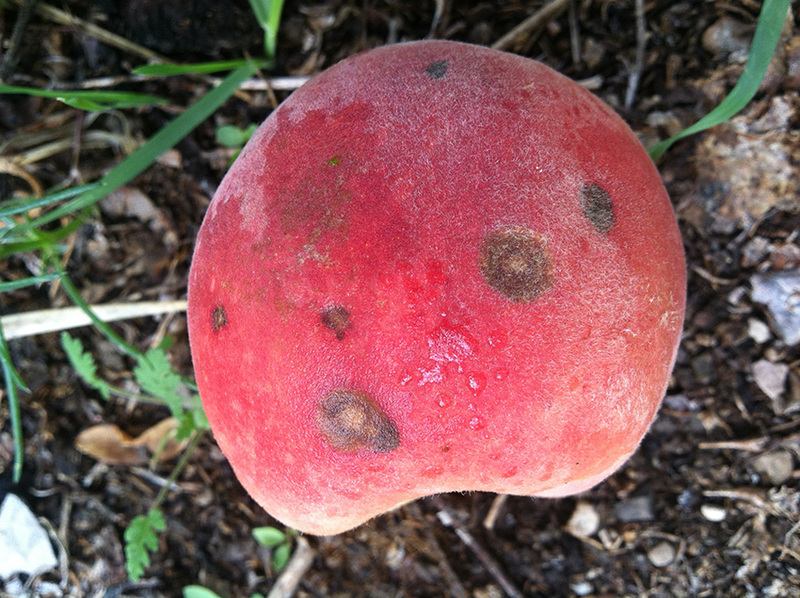 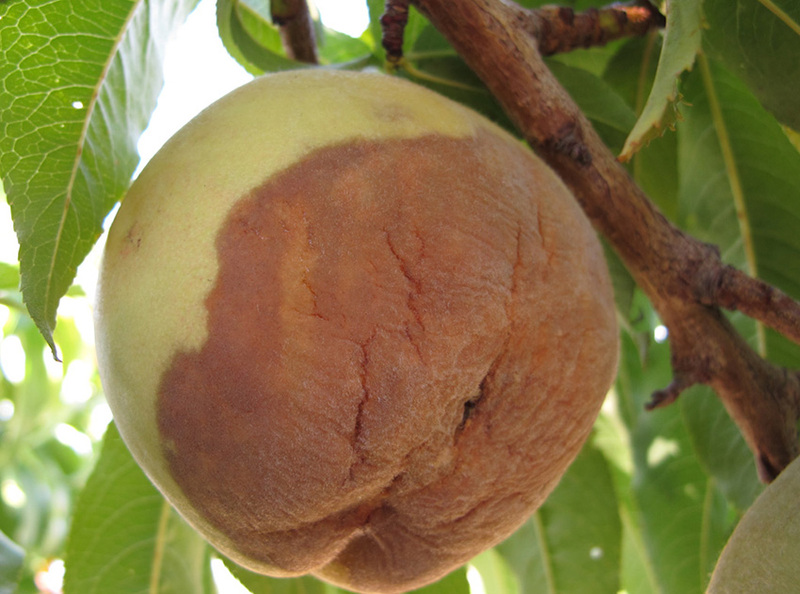 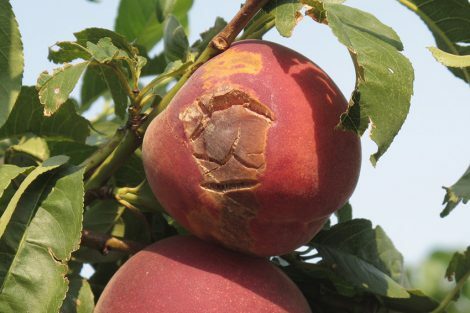 Injury to peach flesh, followed by infection of brown rot. 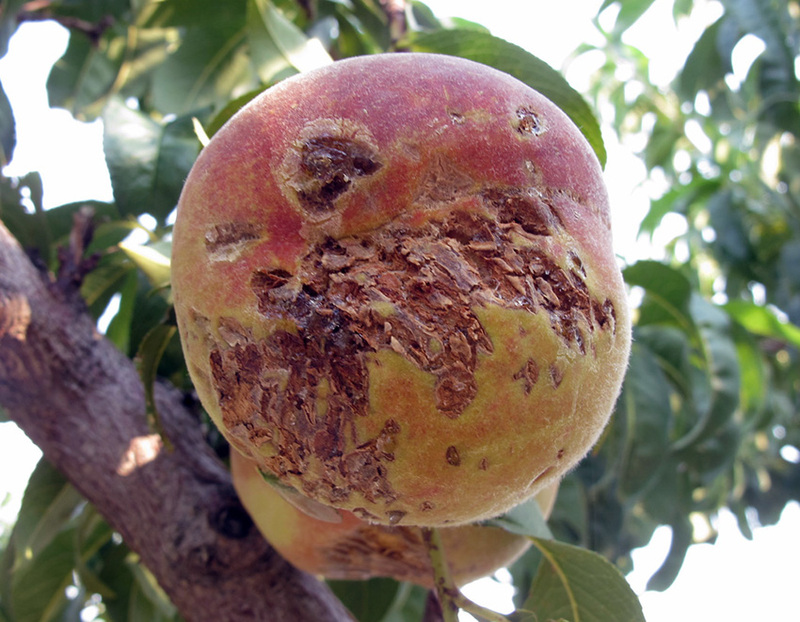 Feeding damage from starlings, that peck deep into the flesh. 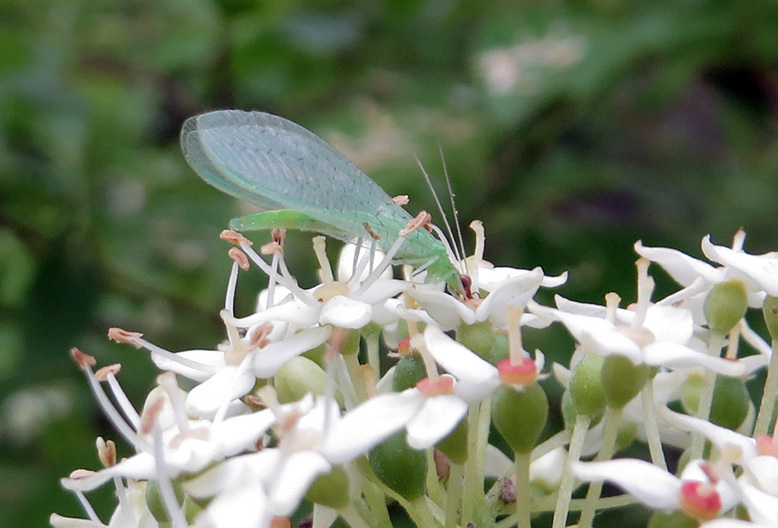 Lacewing larvae are voracious predators, but the adults need pollen and nectar to survive. 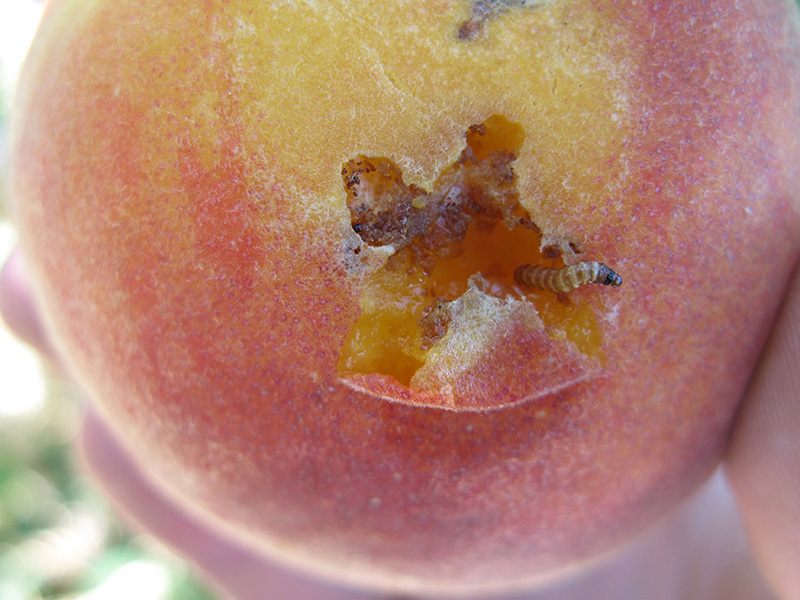 Identification of predators and parasitoids that attack insect pests. 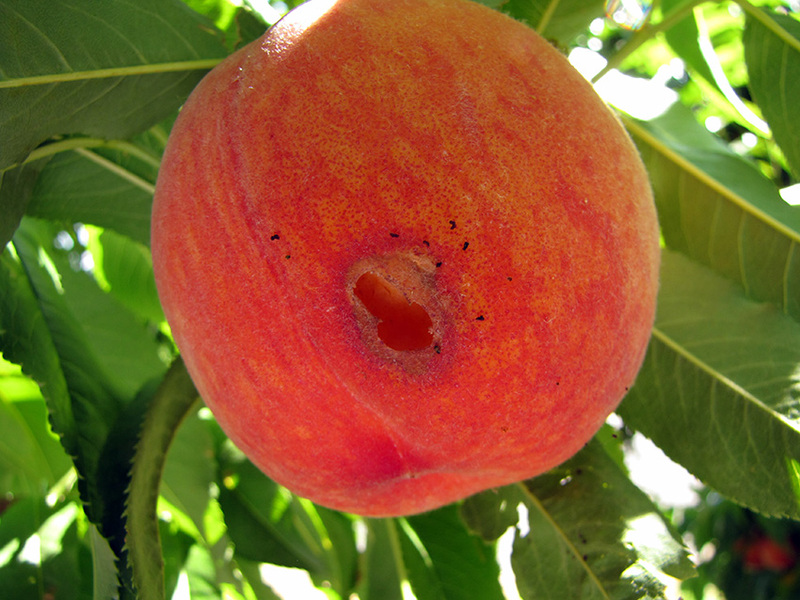 Recognizing the habitat needs of beneficial insects. 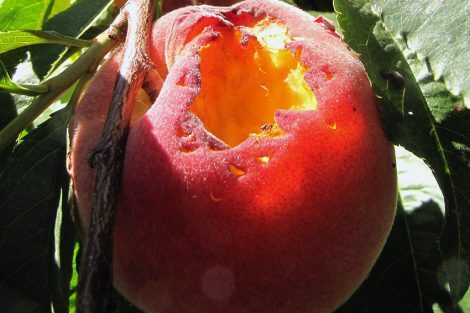 Design and implementation of habitat improvements, including site preparation, insectary strip plantings, hedgerows, beetle banks, and more. 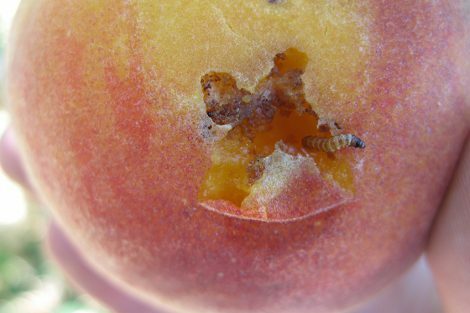 The current best management practices that minimize land-use impacts on beneficial insects and mitigate exposure to insecticides. 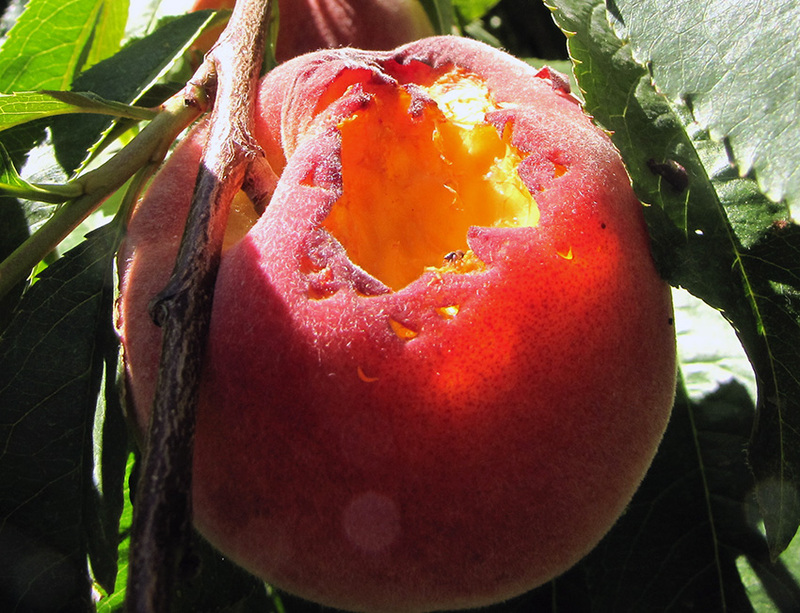 How: Registration is $45 and includes a packet of materials from the Xerces society, including their book, Farming with Native Beneficial Insects. 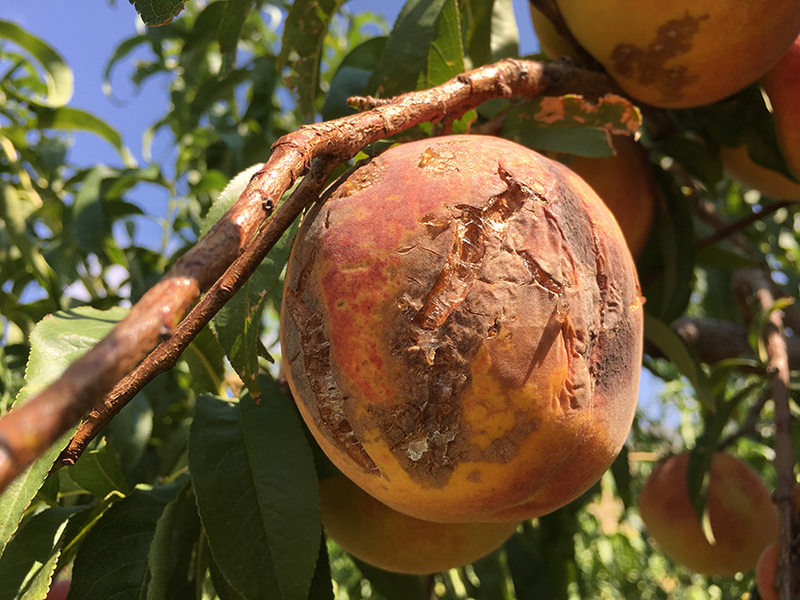 The Utah IPM Program is working with the Utah office of the National Agricultural Statistics Service to determine the use of IPM in tree fruits, and how it is affecting profits. 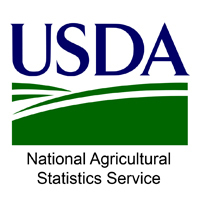 Be on the lookout for the envelope from NASS, and please be sure to fill out and return the survey! 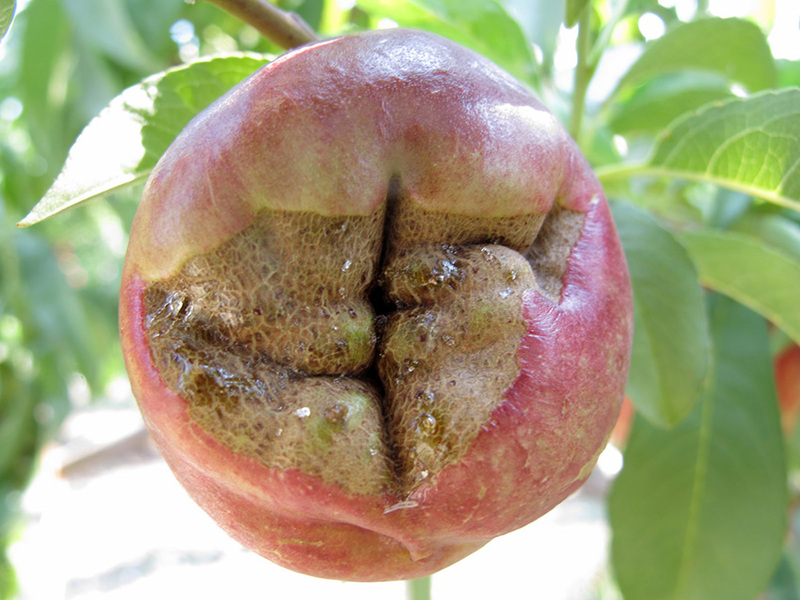 The results will help the IPM Program to continue to serve the needs of our fruit growers. 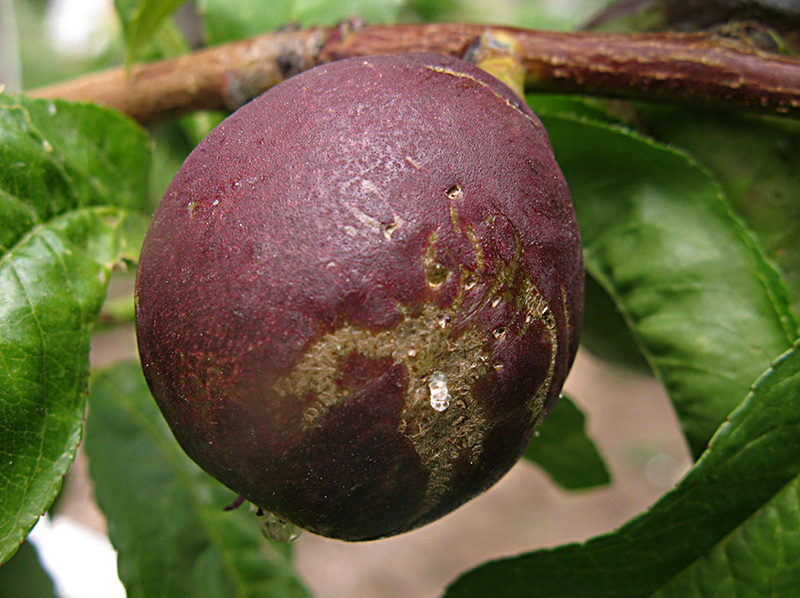 Obliquebanded leafrollers feed on foliage and fruit. 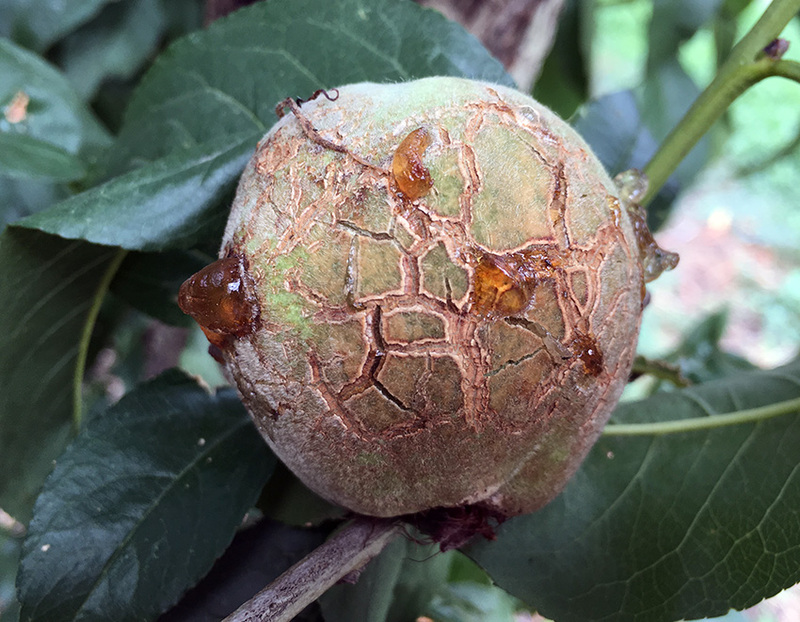 Entomologist, Diane Alston, and Marion Murray conducted a 2-year project to identify the primary leafroller species causing damage to Utah orchards. 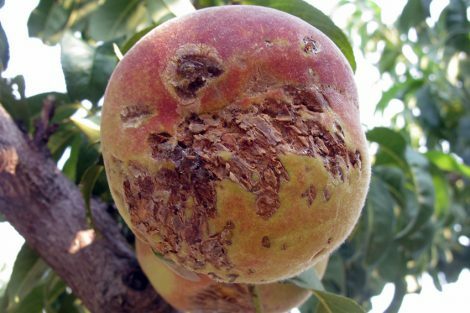 Obliquebanded leafroller was the most common, primarily causing injury to tart cherries, and contaminating tart cherry harvest bins. 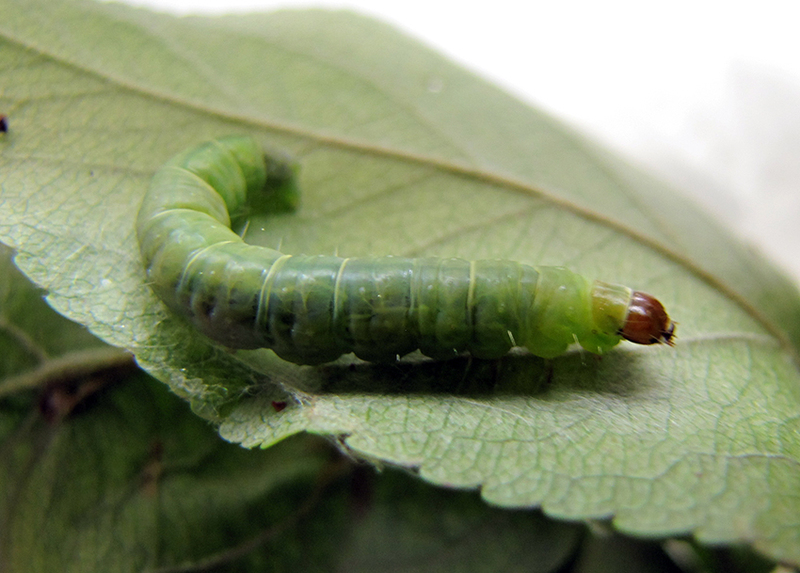 Click here to access the fact sheet that describes the leafroller species we found, including their biology, management, and where they occur.